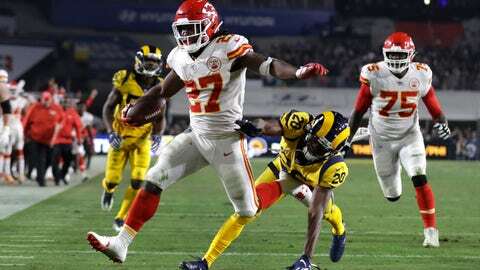 Kareem Hunt scores one of the Chiefs' six offensive touchdowns against the Rams. KANSAS CITY, Mo. — The Kansas City Chiefs walked out of Memorial Coliseum in Los Angeles late Monday night confident that they could beat the Rams if they should get a rematch in the Super Bowl. If only they don’t have to beat themselves, too. For all the positives the Chiefs could take from their 54-51 shootout loss to the Rams — and there were plenty — the glaring mistakes overshadowed them. Patrick Mahomes tossed a trio of interceptions, lost a pair of fumbles and was sacked three times. The defense gave up too many big plays. Harrison Butker missed an extra point. And the Chiefs were penalized 13 times for 135 yards. Yet the Chiefs still led the Rams in the fourth quarter in a record-setting, back-and-forth offensive bonanza. They still had a chance to beat one of the NFL’s top teams on the road. So yes, they walked away with a loss. But also with a lot of confidence. “I mean, the fact that we were in this game with three scoring turnovers, we gave them 21 points off turnovers and they’re a good team,” Chiefs wide receiver Chris Conley said. The Chiefs (9-2) had done that most of the season. They had only eight turnovers over their first 10 games, and while penalties have been a constant problem, they had been able to overcome them. That all changed under the bright Monday night lights. Los Angeles linebacker Samson Ebukam returned Mahomes’ first fumble for a touchdown in the second quarter. He returned an interception 25 yards for another score in the third. And two interceptions in the final minutes scuttled any chance of setting up Butker for a tying field goal. The Chiefs will have a bit of extra time for that self-assessment. They returned to Kansas City for their bye week, giving them an opportunity to reflect and recover. There were plenty of positives to reflect upon in Los Angeles, too. — Mahomes threw for 478 yards, the second-most in franchise history, and matched his own club record with six touchdown passes. His quarterback rating just edged that of Rams counterpart Jared Goff, while his TD total set a record for a game on Monday night. — Tyreek Hill had a career-high 10 catches for 215 yards and two TDs. It was the second-highest yardage total in Chiefs history, trailing only Stephone Paige’s 309 yards against San Diego in 1985. — Tight end Travis Kelce also had 10 catches for 127 yards and a score, extending his streak of games with a reception to 74 — the third-longest in franchise history. — Kareem Hunt ran for 70 yards while catching three passes for 41 yards and a score. That made him the first player since Lenny Moore of the Baltimore Colts in 1961 to have seven touchdowns through the air and on the ground in his team’s first 11 games. There are dozens more statistical superlatives from Monday night’s game, and indeed, from the first 11 games of the season. But perhaps the most important fact is that Kansas City’s two losses have come on the road against powerhouses in the Rams and Patriots. The Chiefs also remain atop the AFC West and have the No. 1 seed in the playoffs still firmly in their sights. If the Chiefs want that rematch with the Rams in the Super Bowl, the one they are confident they can win, earning a playoff path through Arrowhead Stadium will be paramount down the stretch. “You wanted to go win that game going into the bye week against a good team like that, a playoff team. But at the same time, we still control our own destiny,” Mahomes said.